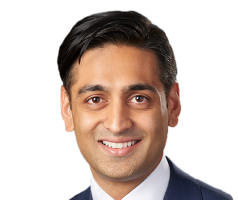 Dr. Vinit “Vin” Amin joined Consulting Radiologists, Ltd. (CRL) as the newest member of the Vascular & Interventional Radiology section. Originally from Bismarck, North Dakota, Dr. Amin traveled to Rochester, New York for Medical School, receiving his Degree at the University of Rochester School of Medicine and Dentistry. While in New York, Dr. Amin completed an internship in Internal Medicine at the prestigious Lenox Hill Hospital located in Manhattan’s Upper East Side, New York, NY. He then went on to complete a Radiology residency and fellowship in Interventional Radiology at the Icahn School of Medicine at Mount Sinai Hospital, New York, NY. Dr. Amin is also a registered physician by the American Registry of Diagnostic Medical Sonographers, specializing in Vascular interpretation. On his off days, Dr. Amin enjoys exploring the Minneapolis food scene, spending time with friends and family, and learning miscellaneous movie trivia.